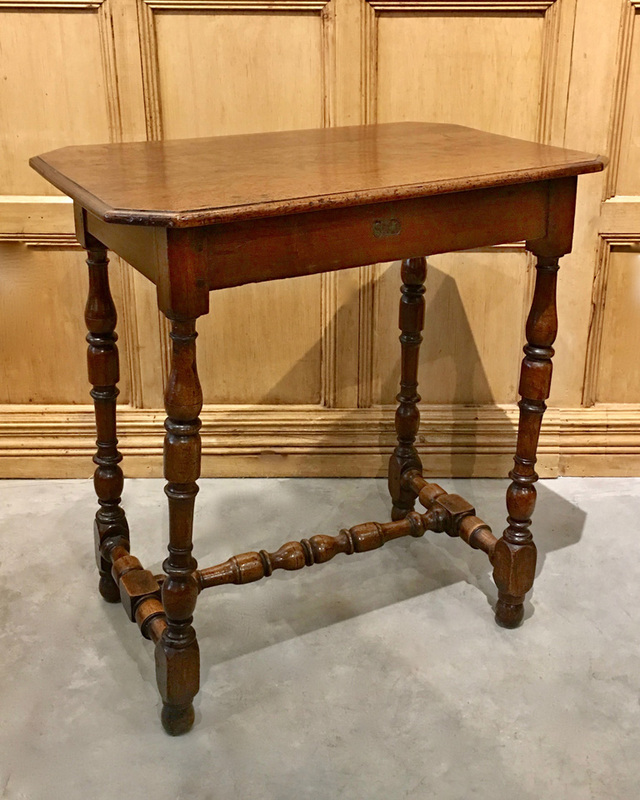 A fine early 18th Century Walnut Gateleg with original drawer. Wonderful color and patination. The legs on which the attention was focused are crisply carved with bold turnings. 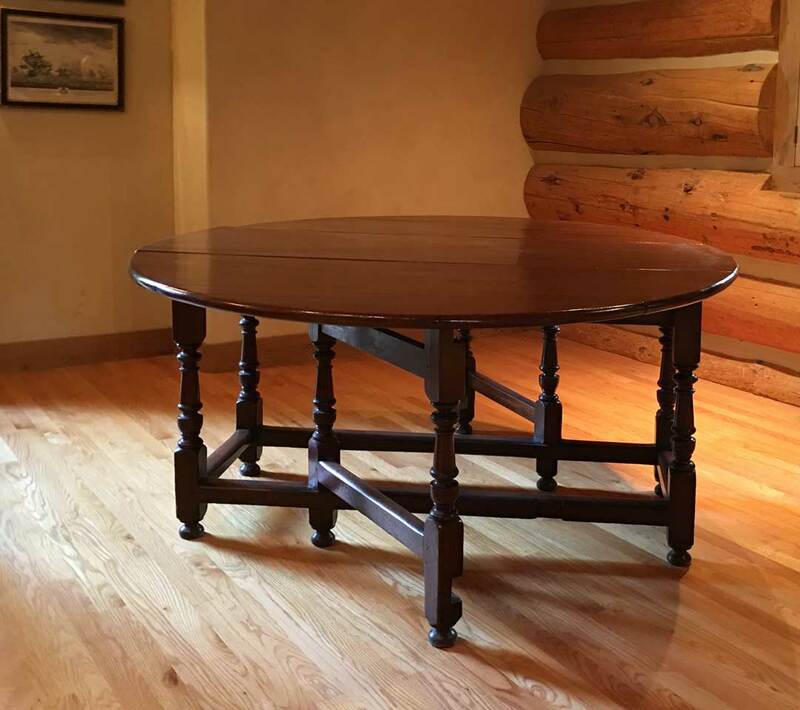 56.5" x 47" x 29.50"
This table has bold baluster and bobbin turn legs joined by a simple stretcher. Very good top and color. It makes a perfect coffee table. 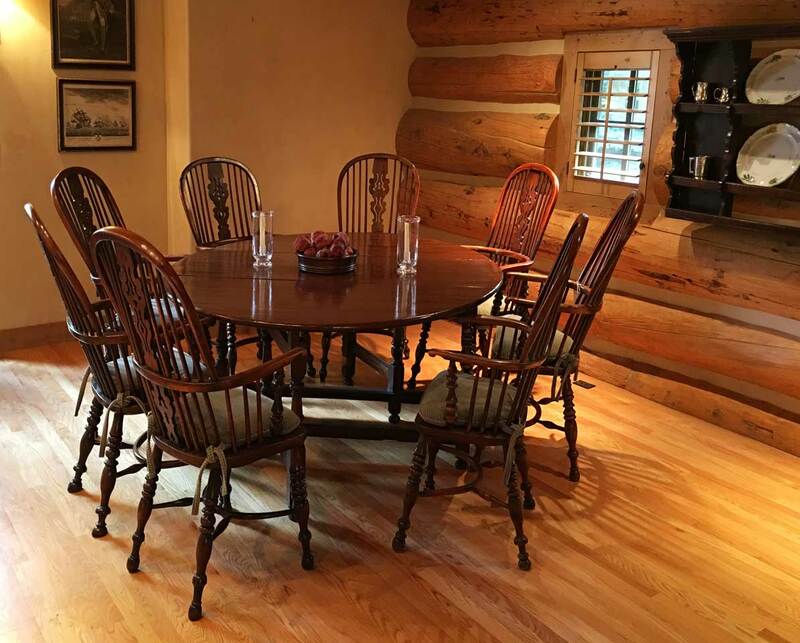 This table has bold baluster and bobbin turn legs joined by a simple stretcher. Very good top and color. It makes a perfect coffee table. 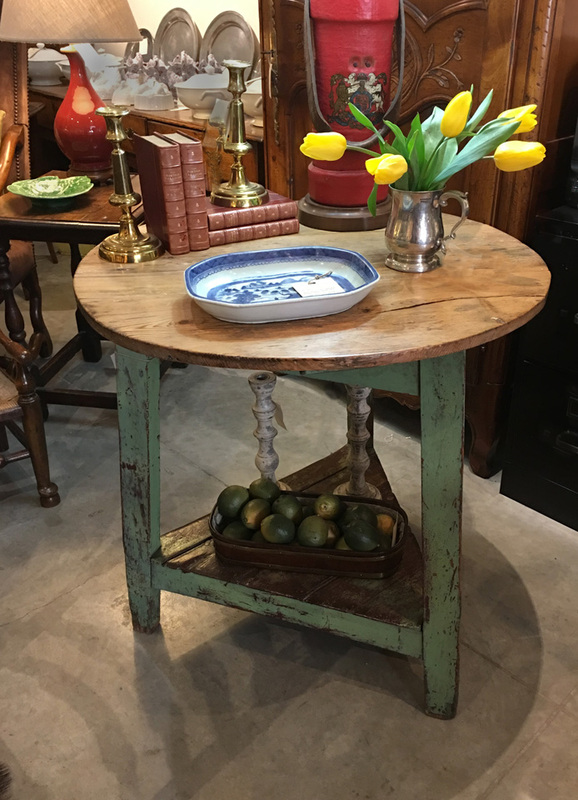 17th Century Louis XIV Cherry Farm Table with 2 drawers and a bread slide. 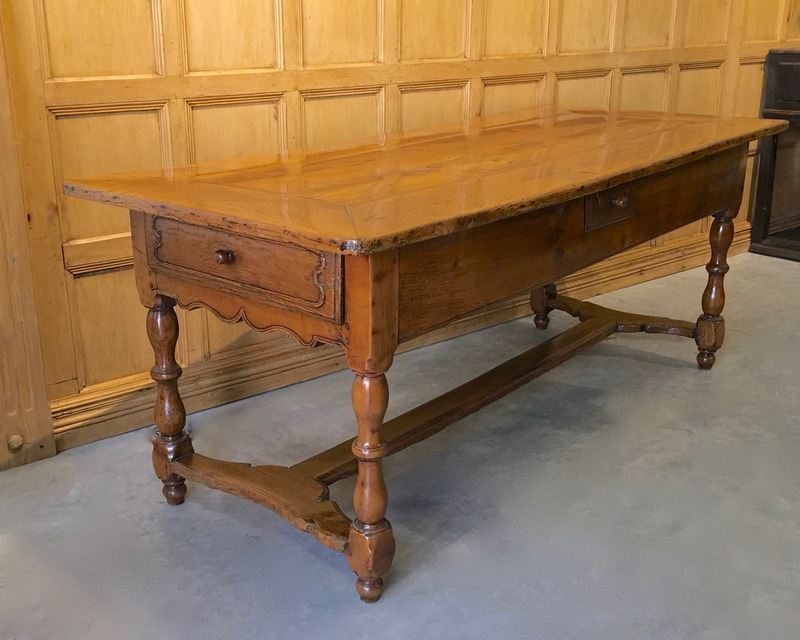 An 18th Century English Oak Lowboy with well formed cabriole legs. The drawer fronts have ovolo moulded fronts and double half-round corners (babies bottom). The brass handles are period, if not original. 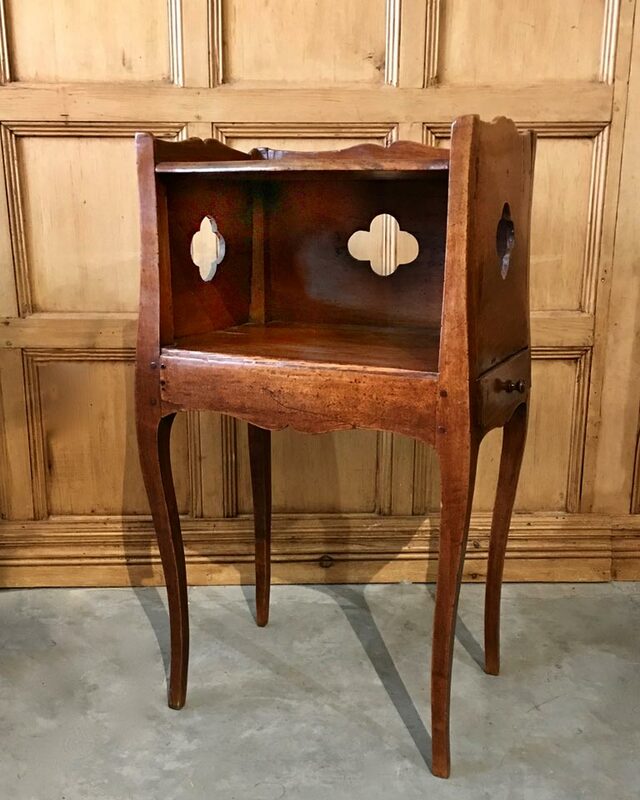 Small 17th Century French Walnut Louis XIII Side Table. 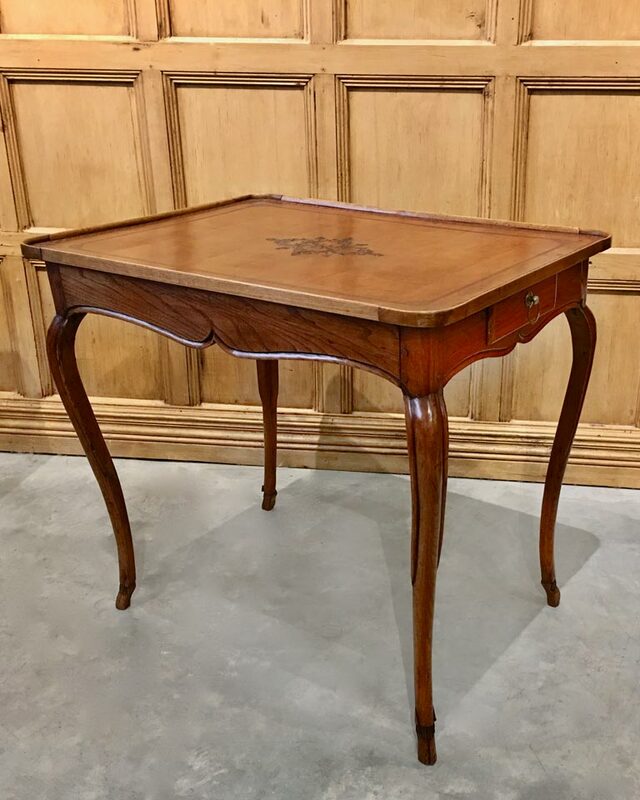 This extraordinary small table is from the chateau in the south of France. It has the chateau inventory mark carved on the apron. 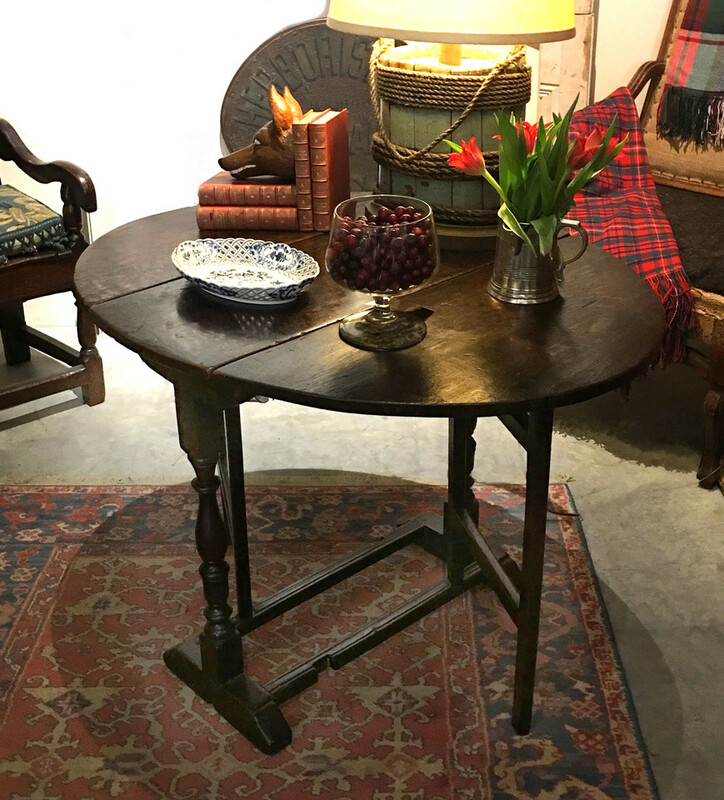 18th Century French Cherry Louis XV Table with a leather top. 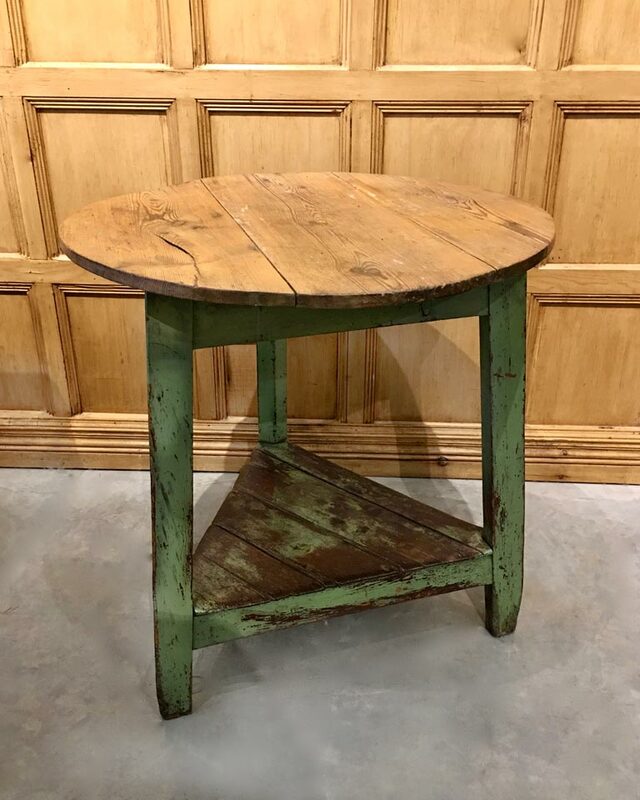 19th Century English Painted Cricket Table. 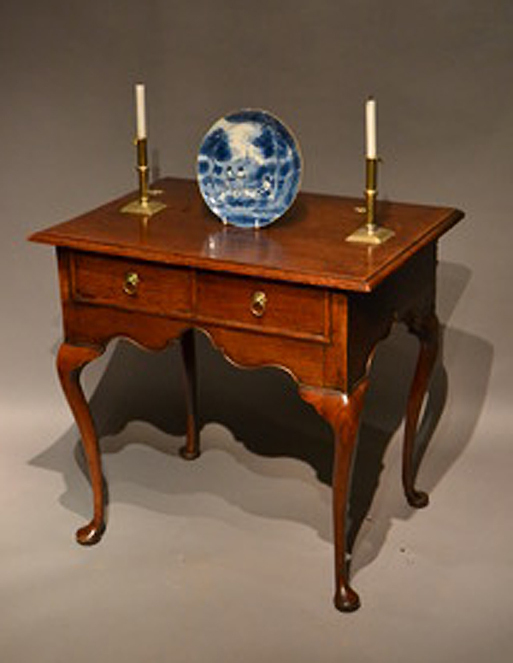 Louis XV Mulberry Side Table with drawer. 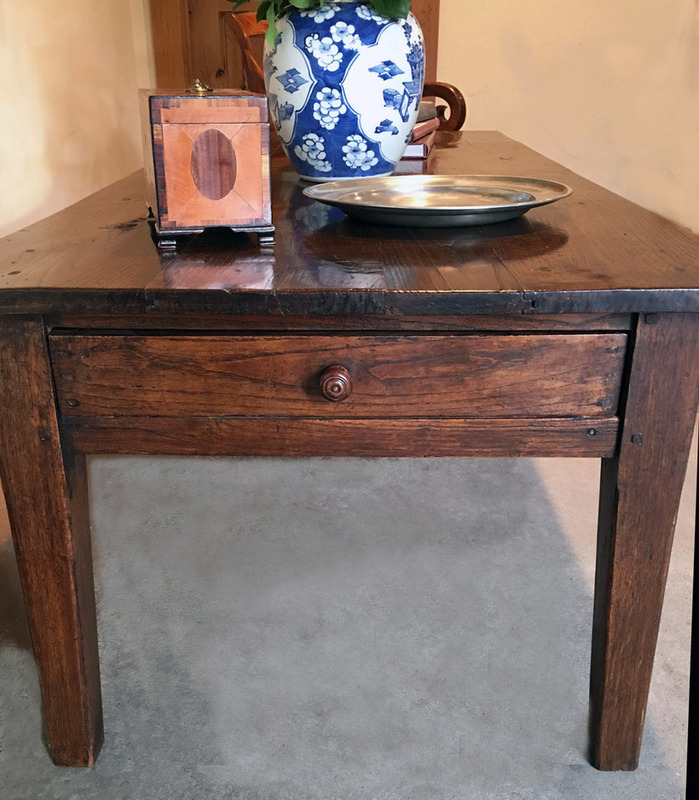 A fine early 18th Century Walnut Gateleg Table with original drawer. Wonderful color and patination. The legs on which the attention was focused are crisply carved with bold turnings. 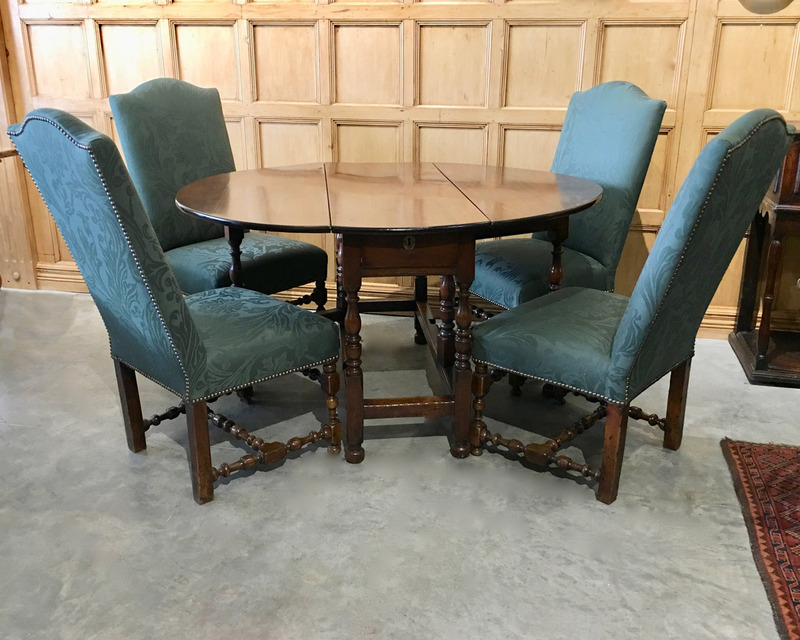 A set of four early 18th Century Louis XIV walnut side chairs with superb turnings from a small chateau in the Dordogne. 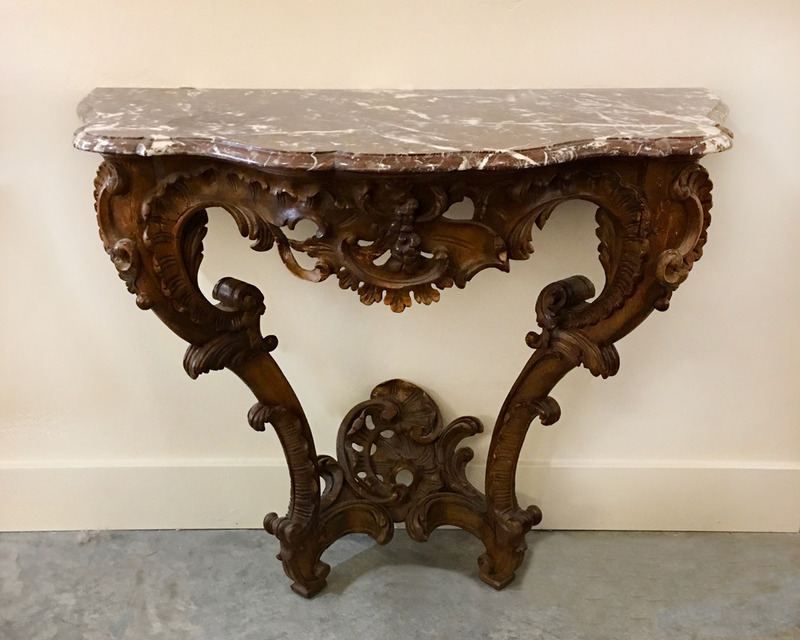 18th Century French Louis XVI Linden Console Table with marble top. 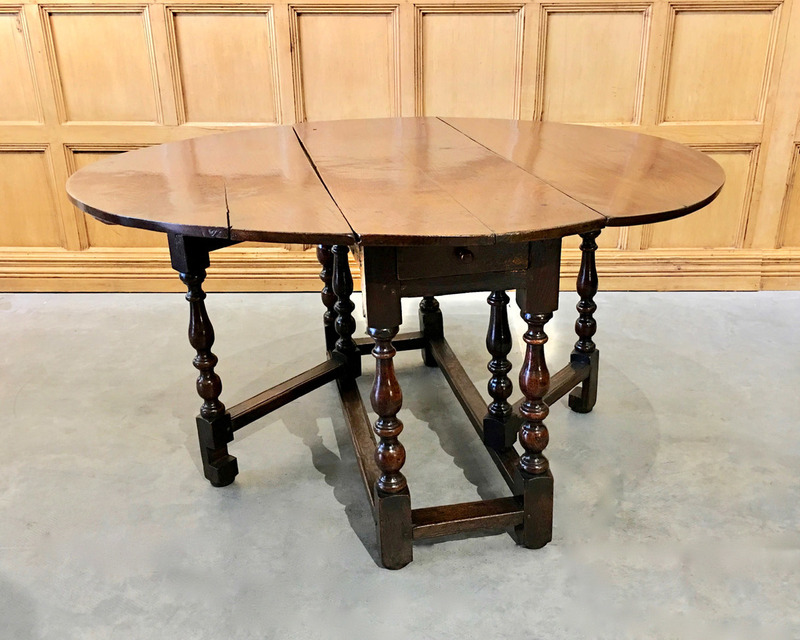 Rare 18th Century Queen Ann Oak Center Table. 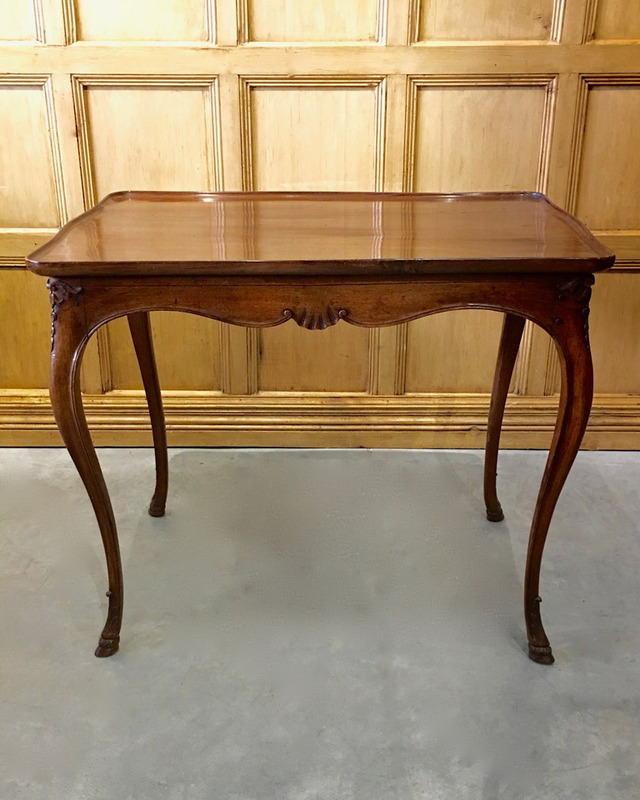 This graceful center table was purchased from a manor house in Shropshire. The good proportions achieve elegance with the decorative element in the apron and stretcher. 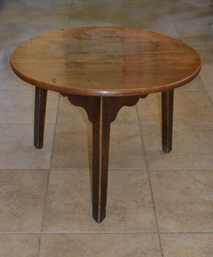 The legs with inverted cup turnings was the fashionable shape for this date. 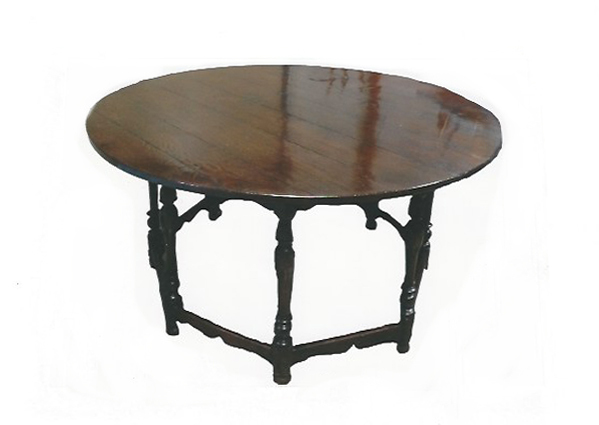 The legs are joined by shaped stretcher forming an octagon shaped base. The top is supported by the shaped carving which is repeated on the apron. A rare piece. 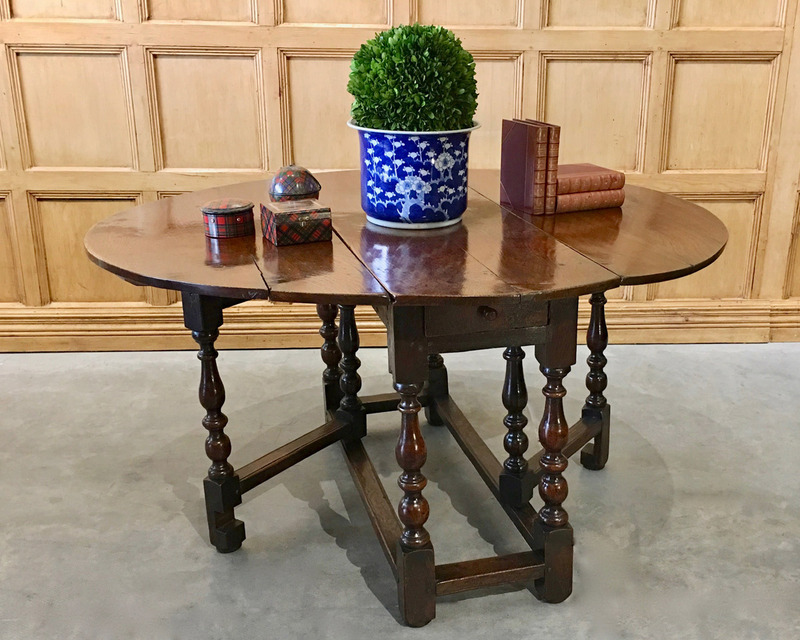 A large rare 18th Century Gateleg Table made from Cuban Mahogany..
With the shift to dining in a smaller room at the end of the 17th century came a demand for more convenient form of table. 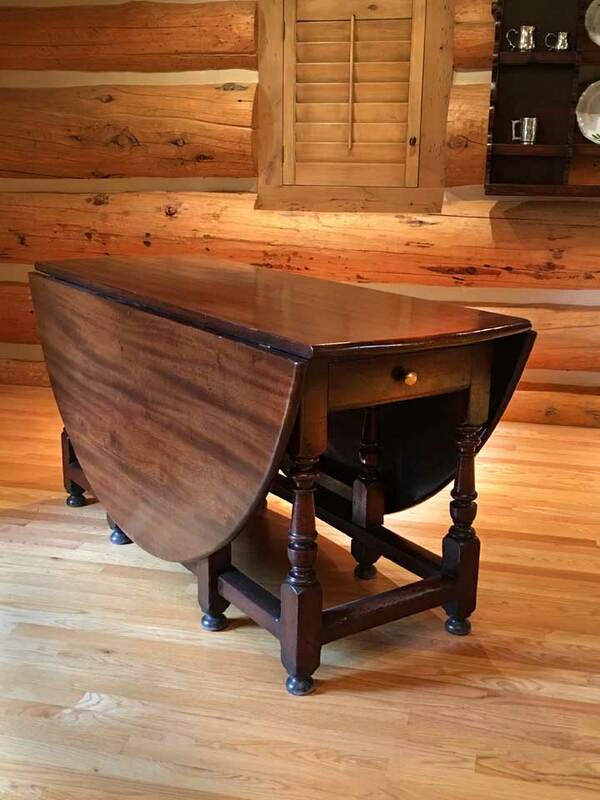 The practicality for a table which occupied little space, could fold up by means of leaves hinged fix top was design in 16th century. 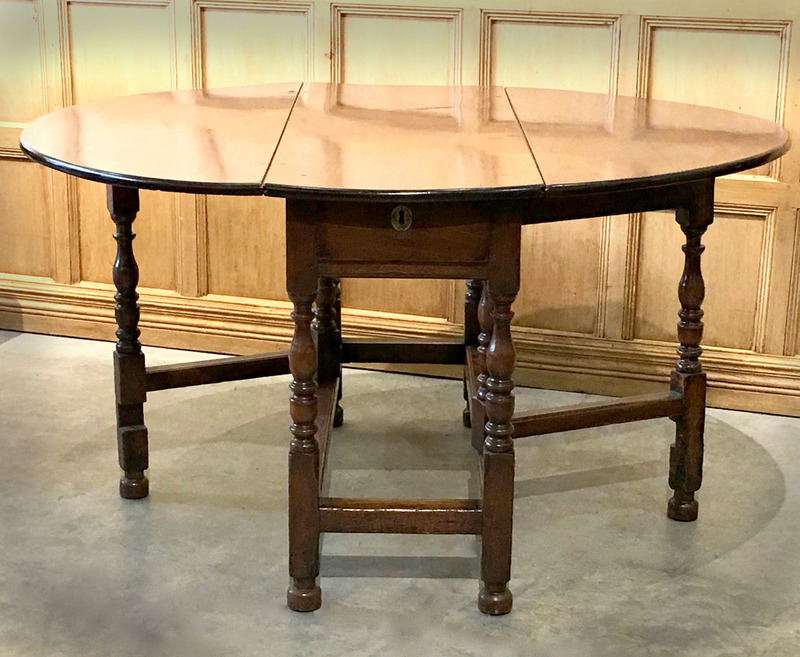 By the 18th Century this type of larger table was in demand and was now made in the most expensive of woods...Cuban Mahogany. 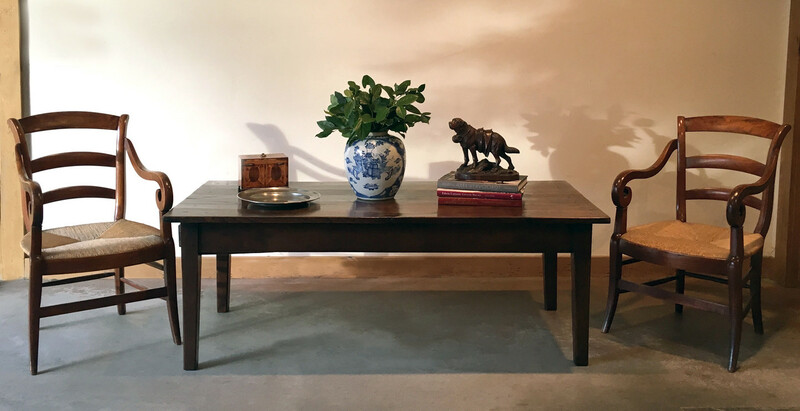 This table with its boldly turned legs, wide bed, it's grande size and beautifully figured mahogany made it very desirable for those that could afford it. 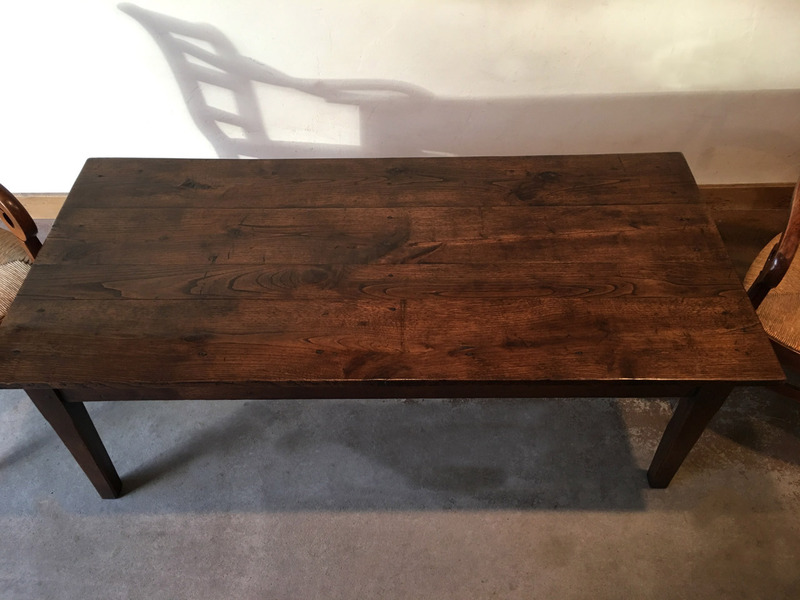 19th Century French Chestnut Farm Table made into a coffee table. 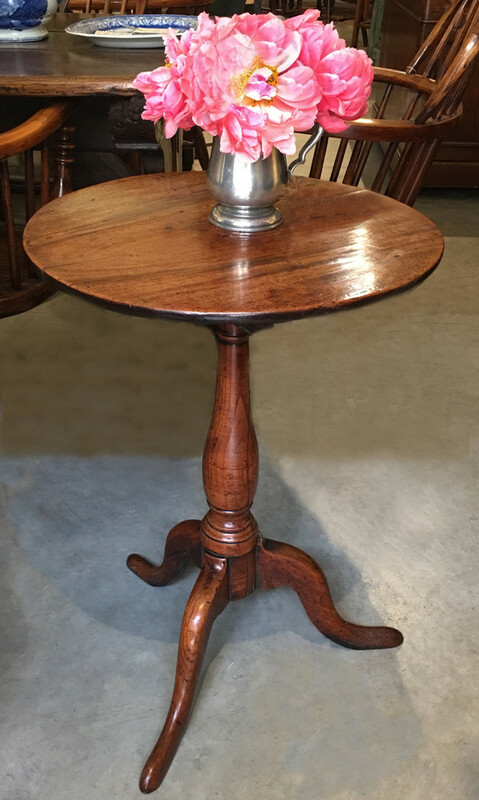 George III English Candle Stand with a lovely faded Mahogany top which matches perfectly the elegant fruitwood baluster turned stem and the swept legs. figuring, an ogee apron and chamfered legs. 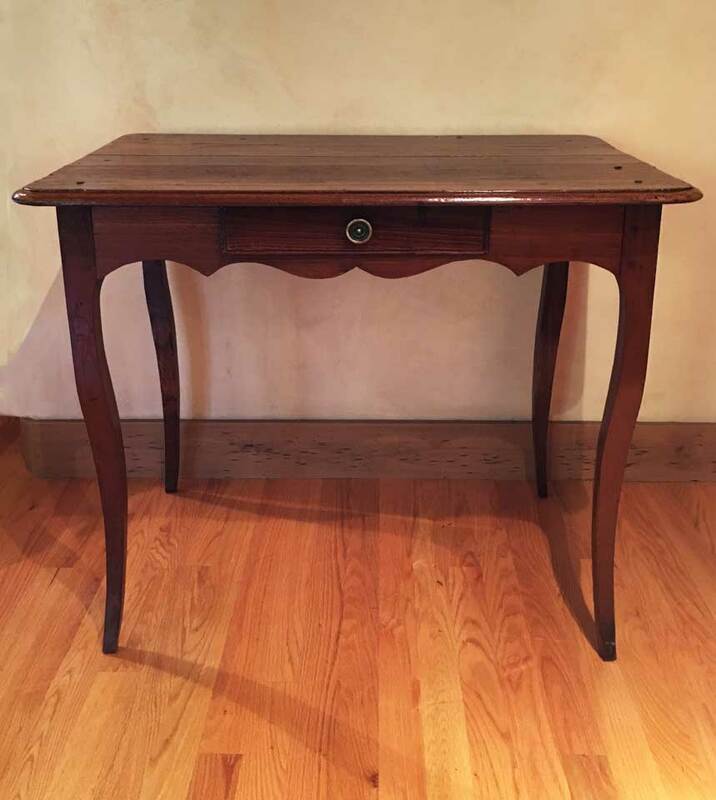 A small George II Oak Lowboy. 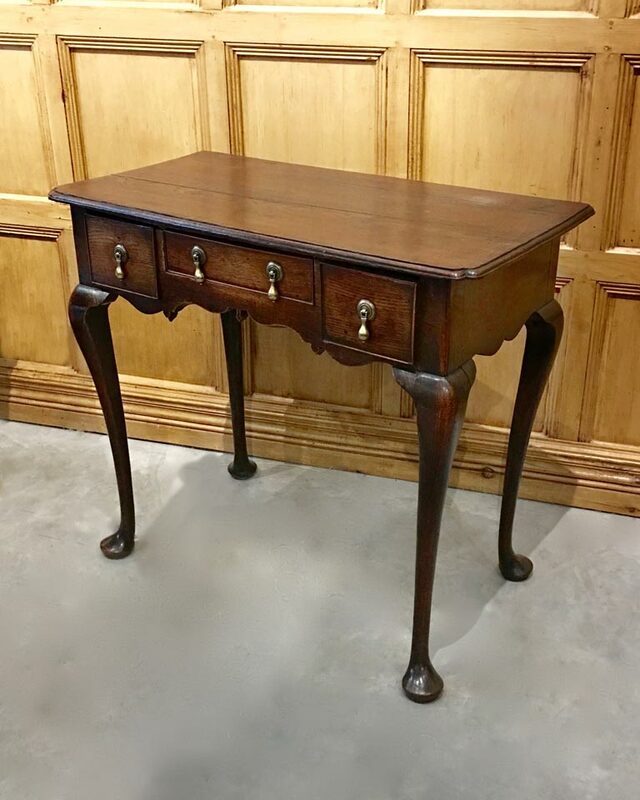 This delightful table has a moulded edge top, a pair of small drawers with applied moulding surround, Agee arch to the sides and front and four well drawn legs terminating in pad feet. 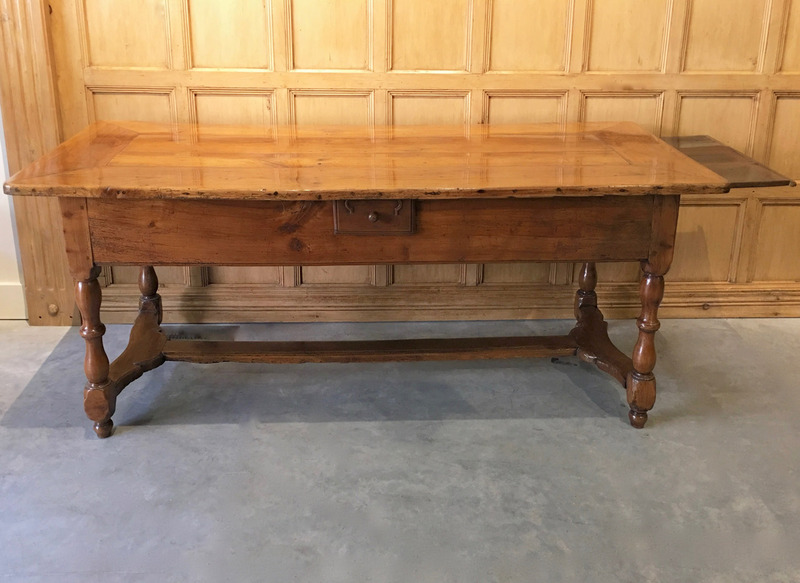 A William & Mary Oak Gateleg Table. 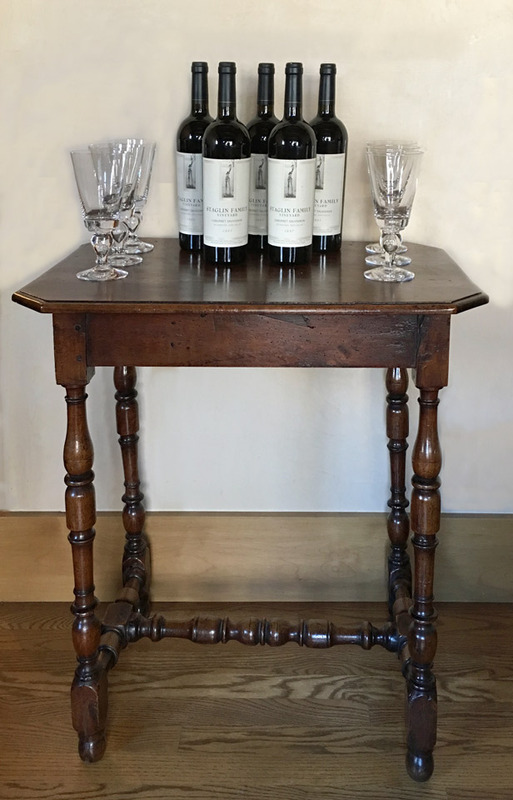 A lovely table with a top comprising three single planks, rectangular profile gate, baluster turned stem and sled feet. Good untouched color and conditions.